Navigating the unfamiliar streets of a new city, sometimes you just want to find a quiet place where you can take a breather and figure out what’s next on your itinerary. And, chances are, you’re not going to be pulling out a big folded paper map to do so. 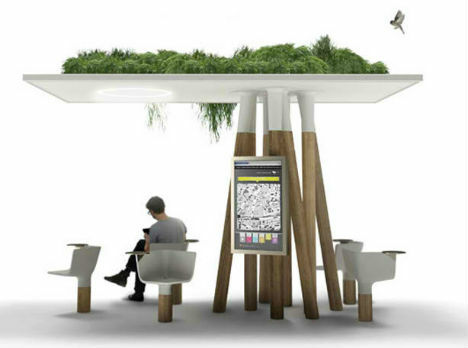 So a public, shaded resting spot where you can not only consult a city guide, but also access wi-fi and charge your gadgets, would certainly be welcome. 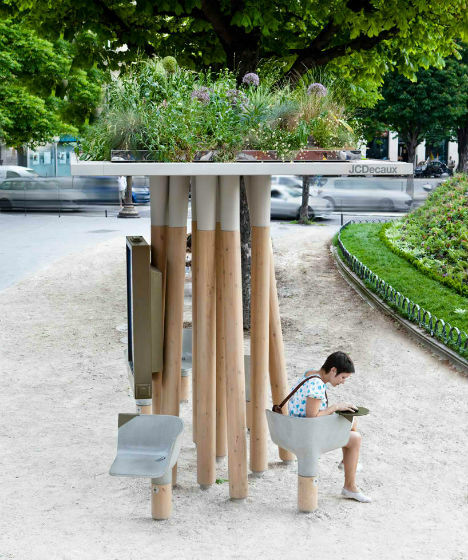 JCDecaux, the North American company that invented the ‘street furniture’ concept of outdoor advertising, collaborated with designer Mathieu Lehanneur to create a cool green-roofed rest stop for pedestrians in Paris. The garden platform makes the curbside lounge area more aesthetically pleasing for people viewing it from their upper-floor apartments nearby. Designed for an urban development project commissioned by the city, ‘Escale Numerique’ features a green-roofed platform held aloft over the sidewalk by tree trunks. 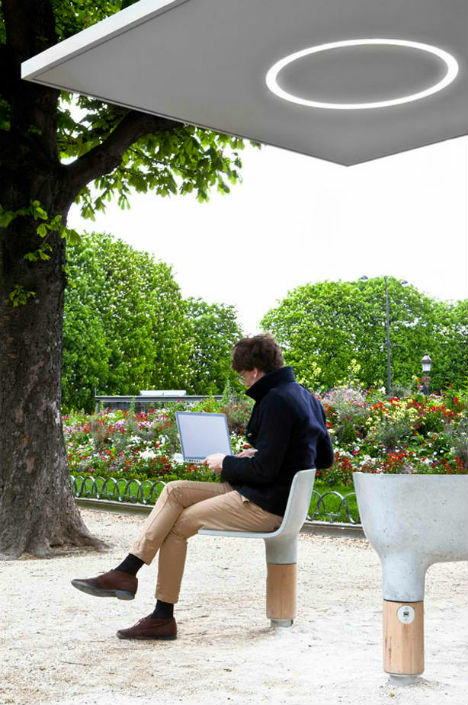 The swiveling concrete seats are equipped with little desks and even electrical outlets to charge up your computer and phone on the go. The shelter also features a large touch screen that provides information about city services like guides and news. Escale Numerique is meant for the Rond Point des Champs-Elysées. 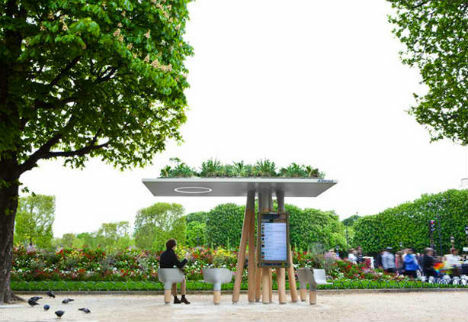 “Like the Wallace fountains, which since the end of the 19th century have offered Parisian the free drinking water circulating beneath their feet, Escale Numérique allows everyone to benefit from a high-speed wi-fi connection by raising it from beneath the ground,” says Lehanneur.